Have not done too many updates on the new Skype for Business pools, so made some notes based of my experiences with the Lync 2013 servers. There are new PS commands in SfB that really make it so much easier to go thru the whole process more efficiently and are more reliable (especially in a multi-member pool). No more guessing if the Fabric is "really" ready to take down the next member. I upgraded a couple of SfB pools from RTM to version 6.0.9319.88 recently, and it was mostly painless on 2-member as well as 3-member pools. I say mostly, as my servers have "Windows Firewall" disabled by GPO so the pool would not start up because of that, giving me yet another grey hair :-). Step 1: Download and verify the update package. Right-click on the executable file and look at the properties. Ensure that the version information in the Details tab, matches up with the one you intend to apply to your servers. Also look at the documentation to see if there are any prerequisites for the update. The "Disable/Enable all Lync services" ones are especially helpful when the OS will need to be restarted a couple of times, and you don't want to deal with the hassle of waiting for the Pool/Windows Fabric to settle down first. 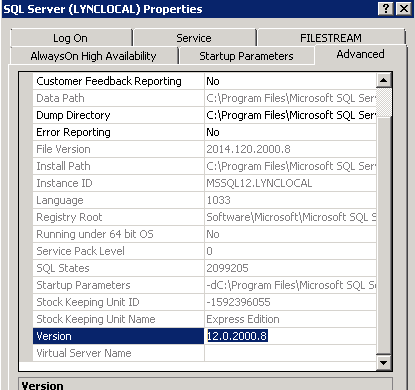 Interesting find: Skype for Business installs SQL Express 2014 on the FE servers. 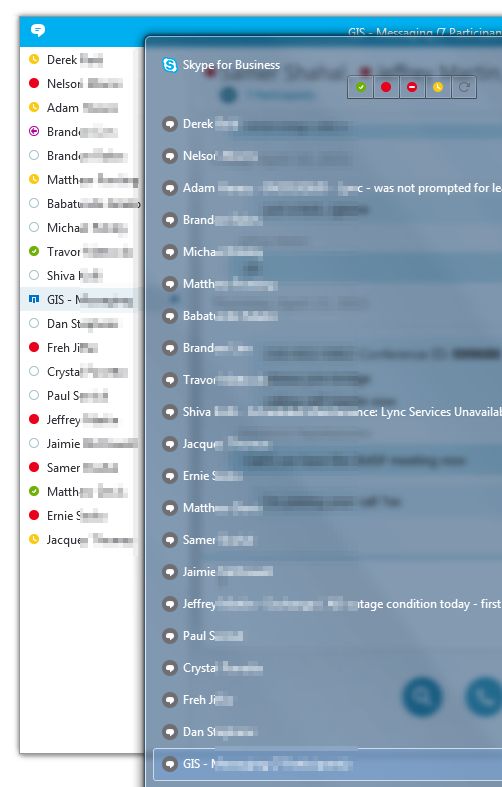 Symptom: Lync for Mac 2011 | Delegates not able to see delegators or manage Lync meetings in Lync for Mac 2011. Cause: Delegate functionality is not currently present and supported in Lync for Mac 2011. Delegator (add delegate) functionality is only delegate/delegator functionality currently supported. These events can be ignored if you have Exchange 2010. UnsupportedStoreException: code=ErrorIncorrectExchangeServerVersion, reason=GetUserSettings failed, smtpAddress=User2@domain.com, Autodiscover Uri=https://autodiscover.domain.com/autodiscover/autodiscover.svc, Autodiscover WebProxy=<NULL> ---> Microsoft.Exchange.WebServices.Data.ServiceRequestException: The request failed. The remote server returned an error: (401) Unauthorized. ---> System.Net.WebException: The remote server returned an error: (401) Unauthorized. Check event details. Check autodiscovery Uri is properly configured and reachable. Check that proxy setting is properly configured and reachable. Validate Skype for Business to Exchange Autodiscovery configuration by following the trouble shooting guide. If problem persists, notify your organization's support team with the event details.